The Arroyo Seco Foundation (ASF) was founded by Charles Lummis more than one hundred years ago to promote the preservation and promotion of the Arroyo Seco, one of Southern California's greatest natural treasures. ASF advocates an integrated, harmonious approach to watershed and flood management, water conservation, habitat enhancement as well as the expansion of recreational opportunities. Through action projects, recreation and environmental awareness activities, ASF strives to involve the residents and organizations in our region in this tremendous enterprise. As a member of the California ReLeaf tree-planting network, ASF works to reforest the Arroyo Seco, the San Gabriel Mountains and the neighboring urban landscape with native shrubs and trees. Arroyo Seco Watershed Restoration -- This comprehensive approach to mountain and urban watershed management is a partnership of ASF and and the many organizations of the Council of Arroyo Seco Organizations (CASO). Arroyo_Seco_News -- This lively email news and discussion groups offers a forum for Arroyo afficionados to stay up-to-date and spread the work about important Arroyo issues, projects and events. Monitoring Arroyo Planning Efforts -- A multitude of planning efforts are now underway to upgrade and transform the Arroyo. These include the development of a master plan for the Angeles National Forest, Pasadena's Arroyo Seco EIR, South Pasadena developments, Debs Park, Confluence Park planning and other efforts. Tours and Educational Events -- ASF offers a variety of types of tours of the Arroyo Seco and a series of educational programs about the habitat, culture and history of the Arroyo Seco. Volunteer Opportunities -- There are lots of ways to get involved in protecting and restoring the Arroyo Seco. 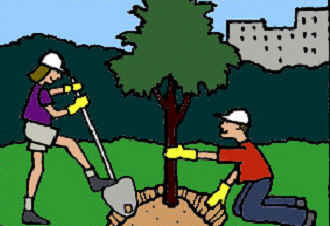 ASF organizes periodic clean-ups, tree-plantings and other activities. "The mission of the Arroyo Seco Foundation is to preserve and enhance the Arroyo Seco from the San Gabriel Mountains to the Los Angeles River, reforest our region and promote environmental and cultural awareness of one of Southern California’s greatest natural resources." CASO -- the Council of Arroyo Seco Organizations -- has become a key network for organizations working to improve the Arroyo Seco from the mountains to downtown LA. For more information. CASO organizations meet each quarterly to exchange information aout Arroyo projects and to plan and work togehter for the future. ASF provides organizational support to this vital network. The governmental agencies which manage the Arroyo Seco have been meeting together regularly for eight years now to discuss common goals and projects affecting this unique region. This important network is called CASA -- the Council of Arroyo Seco Agencies.